Tapas Himalayan ToursDharamshala – a tiny city lies on a spur of the Majestic Dhoula Dhar Mountain range. 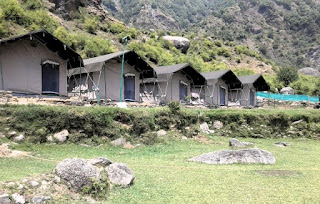 Our Camp is located in village Thatri, Tehsil Dharamshala, which is about 6 kms from Dharamshala main bus stand and at an Altitude of 1700 meter above sea level. It has a closer gimps of the beautiful mountain range. A local stream which is flowing at a walkaway distance from the camp where you can enjoy the Cristal clear snow water. To reach the camp you need to be reasonably fit to walk for 20 minutes from the car park area. Our camp offers the perfect holiday retreat for those who want to escape from the hustle and bustle of daily life and re-connect with nature. We have seven tents with attached bath for accommodation with spectacular views of the Kangra Valley down below and in the back ground of the majestic Dhauladhar mountain. Camping and trekking not only is fun here but it will give you a unique experience. 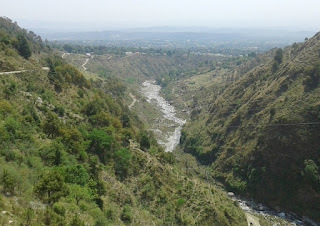 SO COME AND ENJOY OUR PACKAGE FOR 02 NIGHTS /03 DAYS AND EXPLORE DHARAMSHALA AND NEAR BY PLACES. We can pick you from Dharamshala Main Bus Stand and our camp is just 15 – 20 minutes away by car or Pathankot Railway Station which is 80 kms (3 hours drive). You have to walk only 500 meters to reach our Camp site which is known as Himalayan Nest and located at village Thatri (p.o. Khanyara). We serve fresh homely food to our guests. 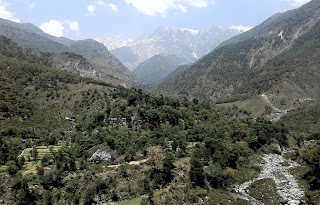 We offer a unique experience of camping, trekking and Villages life at Dharamshala Mountains known as Dhoula Dhar. Transportation: Not included. ( But we can arrange transfer at actual rate by car from Dharamshala Bus stand to camp). Arrive Dharamshala and drive to camp. After lunch enjoy the circular walk to the nearby village to experience the lifestyle of the local villagers of Dharamshala. Visit one of the traditional home and sip a cup of tea there. Later continue your trek to go nearby a stream (Manjhi Khad) of glacier water. If temperature is good you can also swim in the pond of the Manjhi stream. After the dip in the cold water walk back towards the camp for evening tea & snack. 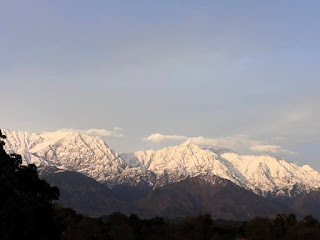 Evening at camp for leisure or book reading with the mighty Dhoula Dhar in your back ground and the beautiful view of Kangra Valley in front. Dinner followed by the campfire.